Mount Pinatubo is an active stratovolcano located on the island of Luzon in the Philippines, at the intersection of the borders of the provinces of Zambales, Tarlac, and Pampanga. Ancestral Pinatubo was a stratovolcano made of andesite and dacite. Before 1991, the mountain was inconspicuous and heavily eroded. It was covered in dense forest which supported a population of several thousand indigenous people, the Aeta, who had fled to the mountains from the lowlands when the Spanish conquered the Philippines in 1565. The volcano's eruption in June 1991, more than 490 years after the last known eruptive activity, produced the second largest terrestrial eruption of the twentieth century. Successful predictions of the onset of the climactic eruption led to the evacuation of tens of thousands of people from the surrounding areas, saving many lives, but as the surrounding areas were severely damaged by pyroclastic flows, ash deposits, and later, lahars caused by rainwater remobilising earlier volcanic deposits, thousands of houses were destroyed. The effects of the eruption were felt worldwide. It ejected roughly 10 billion metric tons of magma, and 20 million tons of sulfur dioxide (SO2), bringing vast quantities of minerals and metals to the surface environment. It injected large amounts of aerosols into the stratosphere—more than any eruption since that of Krakatoa in 1883. Over the following months, the aerosols formed a global layer of sulfuric acid haze. Global temperatures dropped by about 0.5 °C (0.9 °F), and ozone destruction increased substantially. Pinatubo is part of a chain of volcanoes which lie along the western edge of the island of Luzon. They are subduction volcanoes, formed by the Philippine Plate sliding under the Eurasian Plate along the Manila Trench to the west. The word 'Pinatubo' means 'to have made grow' in Tagalog and Sambal which may suggest a knowledge of its previous eruption in about 1500 C.E., although there is no oral tradition among local people of earlier large eruptions. Pinatubo might instead mean a fertile place where crops can be made to grow. 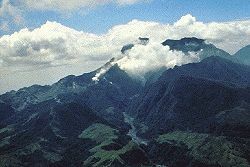 Before the catastrophic eruption of 1991, Pinatubo was an inconspicuous volcano, unknown to most people in the surrounding areas. Its summit was 1,745 m (5,725 ft) above sea level, but only about 600 m above nearby plains, and about 200 m higher than surrounding peaks, which largely obscured it from view. An indigenous people, the Aeta (also spelled Ayta), had lived on the slopes of the volcano and in surrounding areas for several centuries, having fled the lowlands to escape persecution by the Spanish. They were a hunter-gatherer people who were extremely successful in surviving in the dense jungles of the area. These people also grew some staple crops such as wheat, barley and rice. In total, about 30,000 people lived on the flanks of the volcano in villages and other small settlements. The dense jungle covering most of the mountain and surrounding peaks supported the hunter-gathering Aeta, while on the surrounding flatter areas, the abundant rainfall (almost 4 m annually) provided by the monsoon climate and the fertile volcanic soils provided excellent conditions for agriculture, and many people grew rice and other staple foods. About 500,000 people continue to live within 40 km of the mountain, with population centers including the 150,000 in Angeles City, and 20,000 at Clark Air Base. Several important river systems have their sources on Pinatubo, with the major rivers being the Bucao, Santo Tomas, Maloma, Tanguay and Kileng rivers. Before the eruption, these river systems were important ecosystems, but the eruption filled many valleys with deep pyroclastic deposits. Since 1991, the rivers have been clogged with sediment, and the valleys have seen frequent lahars. Studies show that the river systems will take many years yet to recover from the 1991 eruption. Although there seems to be no local knowledge of the previous large eruptions in the Pinatubo area, several Aeta residents reported in 1991 that their elders recalled small explosions in the past. Pinatubo was a known geothermal area before the 1991 eruption, and small steam explosions are quite common in such areas. It was only after volcanic activity began in 1991 that geologists studied the eruptive history of the region in any detail. Eruptions at the site can be divided into two major eras. 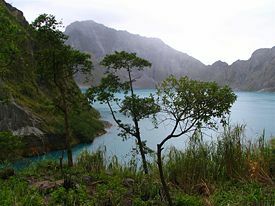 Much of the rugged land surrounding the present volcano consists of remnants of the ancestral Pinatubo. This volcano was located roughly in the same place as the present mountain, and activity seems to have begun about 1.1 million years ago. Ancestral Pinatubo may have reached a height of up to 2,300 m (7,550 ft) above sea level, based on profile fitting to the remaining lower slopes. 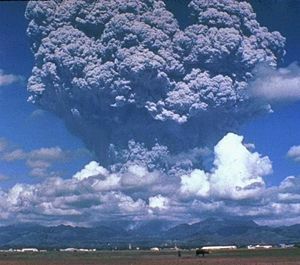 The eruptive activity of ancestral Pinatubo was much less explosive than modern Pinatubo, and probably ended about 45,000 years ago. 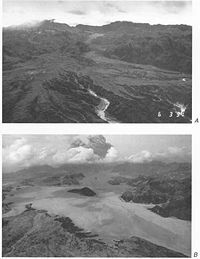 After a long period of dormancy, modern Pinatubo was born in eruptions beginning about 35,000 years ago. The birth of modern Pinatubo occurred in the most explosive eruption in its history, which deposited pyroclastic flow material up to 100 meters thick on all sides of the mountain. The total volume of material erupted may have been up to 25 cubic kilometers (6 mile³), and the removal of this amount of material from the underlying magma chamber led to the formation of a large caldera. Later large eruptions occurred 17,000, 9000, 6000–5000 and 3900–2300 years ago. Each of these eruptions seems to have been very large, ejecting more than 10 km³ of material and covering large parts of the surrounding areas with pyroclastic flow deposits. Scientists estimate that the most recent eruption before 1991 happened about 500 years ago, and after that, the volcano lay dormant. Its slopes became completely covered in dense rainforest, and eroded into gullies and ravines. Following several large earthquakes in July of 1990 and March 15, 1991, scientists immediately installed monitoring equipment and analyzed the volcano for clues as to its previous eruptive history. Radiocarbon dating of charcoal found in old volcanic deposits revealed the three major explosive eruptions in recent millennia, about 5500, 3500 and 500 years ago. Geological mapping showed that much of the surrounding plains were formed by lahar deposits from previous eruptions. On April 2, 1991, the volcano awoke, with phreatic eruptions occurring near the summit along a 1.5 km long fissure. Over the next few weeks, small eruptions continued, dusting the surrounding areas with ash. Seismographs recorded hundreds of small earthquakes every day. Volcanic activity increased throughout April and May. Measurements of sulfur dioxide emission showed a rapid increase from 500 tons per day on May 13 to 5,000 tons/day by May 28. This implied that there was a rising column of fresh magma beneath the volcano. After May 28, the amount of SO2 being emitted decreased substantially, raising fears that the degassing of the magma had been blocked somehow, leading to a pressure build-up in the magma chamber and a high likelihood of explosive eruptions. The first magmatic eruptions occurred on June 3, and the first large explosion on June 7 generated an ash column 7 km (4.5 miles) high. The Philippine Institute of Volcanology and Seismology (PHIVOLCS) led by Raymundo Punongbayan issued a warning indicating the possibility of a major eruption within two weeks. Given all the signs that a very large eruption was imminent, PHIVOLCS worked in cooperation with the US Geological Survey to convince people in the local area of the severity of the threat. A false warning might have led to cynicism about any later warnings but delaying a warning until an eruption began might lead to thousands of deaths, so the volcanologists were under some pressure to deliver a timely and accurate assessment of the volcanic risk. Many of the Aeta who lived on the slopes of the volcano left their villages of their own volition when the first explosions began in April, gathering in a village about 12 km from the summit. They moved to increasingly distant villages as the eruptions escalated, with some Aeta moving up to nine times in the two months preceding the cataclysmic eruption. The first formal evacuations were ordered from the 10 km zone on 7 April. Evacuation of the 10–20 km zone was ordered when a level 4 alert was issued on 7 June. A level 5 alert triggered evacuation of the 20–40 km zone on 14 June, and in all some 60,000 people had left the area within 30 km of the volcano before 15 June. Most people temporarily relocated to Manila and Quezon City, with some 30,000 using the Amoranto Stadium in Quezon City as a refugee camp. In early June, tiltmeter measurements had shown that the volcano was inflating, evidently due to growing amounts of magma filling the reservoir beneath the summit. A small explosion on June 12 marked the beginning of a new, more violent phase of the eruption. A few hours later, large explosions lasting about half an hour generated an eruption column which quickly reached heights of over 19 km, and which generated pyroclastic flows extending up to 4 km from the summit in some river valleys. Fourteen hours later, a 15 minute eruption hurled ash to heights of 24 km. Friction in the uprushing ash column generated abundant lightning. June 15 saw the onset of the climactic eruption. Large tremors saturated all the seismographs at Clark Air Base, which were later rendered inoperative, mostly by pyroclastic density currents. Intense atmospheric pressure variation was also recorded. On the same day, Typhoon Yunya struck the island, passing about 75 km (50 miles) north of the volcano. The typhoon rains made direct visual observations of the eruption impossible, but measurements showed that ash was ejected to heights of 34 km by the most violent phase of the eruption, which lasted about three hours. Pyroclastic flows poured from the summit, reaching as far as 16 km away from it. Typhoon rains mixed with the ash deposits caused massive lahars. The ash cloud from the volcano covered an area of some 125,000 km² (50,000 mi²), bringing total darkness to much of central Luzon. 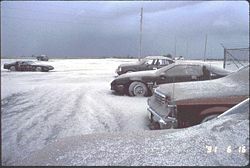 Almost all of the island received some ashfall, which formed a heavy, rain-saturated snow-like blanket. Tephra fell over most of the South China Sea and ashfall was recorded as far away as Vietnam, Cambodia and Malaysia. Nine hours after the onset of the climactic phase, atmospheric pressure waves had decreased to the pre-eruption levels. No seismic records were available at this time, but volcanologists believe by about 22:30 the end of the climactic eruption had arrived. Vast quantities of minerals and metals were brought to the surface. Overall, introduced to the surface environment, was an estimated 800,000 tons of zinc, 600,000 tons of copper, 550,000 tons of chromium, 300,000 tons of nickel, 100,000 tons of lead, 10,000 tons of arsenic, 1000 tons of cadmium, and 800 tons of mercury. In all, the eruption ejected about ten cubic kilometers (2.5 mile³) of material, making it the largest eruption since that of Novarupta in 1912 and some ten times larger than the 1980 eruption of Mount Saint Helens. Ejected material such as tephra fallout and pyroclastic flow deposits are much less dense than magma, and the volume of ejected material was equivalent to about four cubic kilometers (1 mile³) of unerupted material. This colossal eruption had a Volcanic Explosivity Index of 6 . The former summit of the volcano was replaced by a caldera 2.5 km wide. The highest point on the caldera rim now stood 1,485 m above sea level, some 260 m lower than the pre-eruption summit. About 300 people were killed by the eruption, mostly by roofs collapsing under the weight of accumulated wet ash, a hazard that was greatly exacerbated by the simultaneous arrival of Typhoon Yunya. The evacuation in the days preceding the eruption certainly saved tens of thousands of lives, and has been hailed as a great success for volcanology and eruption prediction. However, since the eruption, each rainy season has brought further lahars, which have caused the displacement of thousands of people. Hundreds have died from poor sanitation in relocation camps. Agriculture in the region also suffered badly from the effects of the eruption, with hundreds of square kilometres of formerly arable land being rendered infertile, destroying the livelihoods of thousands of farmers. The United States maintained two large military bases in the region; U.S. Naval Base Subic Bay was 75 km (50 mi.) to the southwest, while Clark Air Base was less than 25 km (16 mi.) to the east of the volcano's summit. Both were abandoned after being severely damaged by the eruption. 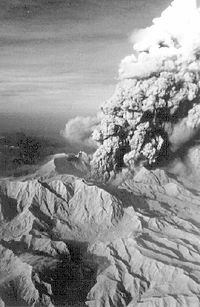 Although the 1991 eruption was one of the largest and most violent of the twentieth century, it was weaker than any of the historical eruptions uncovered by geologists. There is some evidence that eruptions at Pinatubo are getting weaker over time, but this is by no means conclusively established. The eruption of Pinatubo severely hampered the economic development of the surrounding areas. Extensive damage to buildings and infrastructure cost billions of pesos to repair, and further costs were incurred in constructing dikes and dams to control the post-eruption lahars. In total, 364 communities and 2.1 million people were affected by the eruption, with livelihoods and houses being damaged or destroyed. 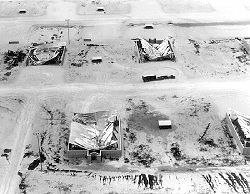 More than 8,000 houses were completely destroyed, and a further 73,000 were damaged. In addition to the severe damage sustained by these communities, roads and communications were damaged or destroyed by pyroclastic flows and lahars throughout the areas surrounding the volcanoes. The estimated cost of repairing the damage to infrastructure was 3.8 billion pesos. Many reforestation projects were destroyed in the eruption, with a total area of 150 square kilometers (37,000 acres) valued at 125 million pesos destroyed. Agriculture was heavily disrupted, with 800 square kilometers (200,000 acres) of rice-growing farmland destroyed, and almost 800,000 head of livestock and poultry killed. The cost to agriculture of eruption effects was estimated to be 1.5 billion pesos. Damage to healthcare facilities, and the spread of illnesses in relocation facilities, led to soaring death rates in the months following the eruption. Education for thousands of children was seriously disrupted by the destruction of schools in the eruption. The gross regional domestic product of the Pinatubo area accounted for about 10 percent of the total Philippine gross domestic product. 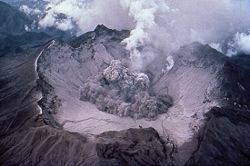 The GRDP had been growing at 5 percent annually before the eruption, but fell by more than 3 percent from 1990 to 1991. The powerful eruption of such an enormous volume of lava and ash injected significant quantities of aerosols and dust into the stratosphere. Sulfur dioxide oxidized in the atmosphere to produce a haze of sulfuric acid droplets, which gradually spread throughout the stratosphere over the year following the eruption. The injection of aerosols into the stratosphere is thought to have been the largest since the eruption of Krakatoa in 1883, with a total mass of SO2 of about 17 million tons being injected—the largest volume ever recorded by modern instruments. This very large stratospheric injection resulted in a reduction in the normal amount of sunlight reaching the earth's surface by up to 5 percent. This led to a decrease in northern hemisphere average temperatures of 0.5–0.6 °C (0.9–1.1 °F), and a global fall of about 0.4 °C (0.7 °F). At the same time, the temperature in the stratosphere rose to several degrees higher than normal, due to absorption of radiation by the aerosols. The stratospheric cloud from the eruption persisted in the atmosphere for three years after the eruption. Following the climactic eruption of June 15, 1991, activity at the volcano continued at a much lower level, with continuous ash eruptions lasting until August 1991 and episodic eruptions continuing for another month. Activity then remained low until July 1992, when a new lava dome began to grow in the caldera. After eruptions ended, a crater lake formed in the 1991 caldera, with the 1992 lava dome forming an island. At first, the lake was small, hot and highly acidic, with a minimum pH of 2 and a temperature of about 40 °C. Abundant rainfall cooled and diluted the lake, lowering the temperature to 26 °C and raising the pH to 5.5 by 2003. 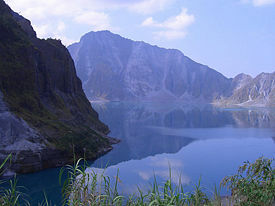 The lake increased in depth by about 1 meter per month on average, until September 2001, when fears that the walls of the crater might be unstable prompted the Philippine government to order a controlled draining of the lake. Approximately 9,000 people were once again evacuated from surrounding areas in case a large flood was accidentally triggered. Workers cut a 5 m notch in the crater rim, and successfully drained about a quarter of the lake's volume. ↑ Smithsonian Institution Global Volcanism Program: Mount Pinatubo Smithsonian. Retrieved December 21, 2007. ↑ The Cataclysmic 1991 Eruption of Mount Pinatubo, Philippines USGS. Retrieved December 21, 2007. ↑ R.G. Garret, (2000) Natural sources of metals in the environment. Human and Ecological Risk Assessment (6), 945–963. ↑ Mt. Pinatube National Geophysical Data Center, NOAA Retrieved December 21, 2007. Decker, R. and B. Decker, (1997) Volcanoes, 3rd edition. New York: W.H. Freeman. Newhall, Christopher G., and Raymundo Punongbayan. 1996. Fire and mud eruptions and lahars of Mount Pinatubo, Philippines. Quezon City: Philippine Institute of Volcanology and Seismology. ISBN 0295975857. Scaillet, B. and Evans, B. W. (1999) The 15 June 1991 Eruption of Mount Pinatubo. I. Phase Equilibria and Pre-eruption P–T–fO2–fH2O Conditions of the Dacite Magma. Journal of Petrology 40: 381–411. Wiesner, M.G., A. Wetzel, S.G. Catane, E.L. Listanco, and H.T. Mirabueno, (2004) Grain size, areal thickness distribution and controls on sedimentation of the 1991 Mount Pinatubo tephra layer in the South China Sea. Bulletin of Volcanology 66: 226–242. Fire and Mud: Eruptions and Lahars of Mount Pinatubo, Philippines USGS Retrieved December 21, 2007. This page was last modified on 25 October 2018, at 15:40.